The Chinese Zodiac Snake personality is, perhaps, the most misunderstood of all the Chinese zodiac signs. They are certainly the most feared. Mystical and mysterious, those born in the Year of the Snake are renowned for their obvious psychic abilities. Snakes simply, always just seem to “know”. People are drawn to the Chinese Snake consciously, subconsciously and, sometimes, almost against their own will. The Snake is one of the most prominent Chinese Symbols as they represent ancient and primordial wisdom. Like the Chinese zodiac sign of the Dragon, it is said the Chinese Snake’s very existence is purely karmic and they’ve arrived in the Year of the Snake for the express purposes of settling debts (whether they owe or are owed). The Chinese Snake’s emotions seem to run so deep, others can easily get a sense that if they become entangled with a Snake, they could get lost forever. Further, not only is this Chinese zodiac sign the deepest of thinkers, they are constantly thinking, calculating and plotting (which can be positive or negative). But they rarely will share their thoughts because, to a Chinese Snake, people are to be mistrusted until proven otherwise. And good luck trying to guess a Snake’s next move! Of the Chinese animals, it is The Snake which usually possesses a great sense of humor. The Chinese Snake is reliable, loyal to the death (as long as they are not betrayed), terrific at making and keeping money and a rock during a catastrophe. Should complete devastation occur, the Chinese Zodiac Snake will, in a most miraculous fashion, “shed their skin” and materialize out of the rubble more resplendent than ever before. The Chinese horoscope chart for this zodiac sign usually foreshadows a life of constant metamorphosis wherein the soul of this zodiac sign seeks the death of jobs, relationships, etc. so they can be ‘born again’. In Chinese symbolism, The Snake is one of the symbols for death and utter destruction. The Chinese Snake never, ever forgets a slight or betrayal and their perception of true justice can be cruel. If this Chinese zodiac sign chooses to go on the attack, watch out. According to Chinese Astrology, Snakes can be ruthless, relentless and will be so without one shred of remorse because in a Snake’s mind, you deserved “it’. Scroll down to find your birth year. This will tell you which “type” of Chinese Snake you are and help you to learn more about how the combined energies of the fixed and secondary element impact your life. Drawing upon the never-ending well of knowledge housed in the even the tiniest drop of water, the Water Snake is the most perceptive and has the most mental dexterity of all the Chinese zodiac Snakes. They are sensitive (though they rarely let it show) and make incredible artists. Those born in The Year of the Water Snake are the more materialistic of the lot and most likely will be able to buy whatever they want because are ingenious with regards to making and keeping money. Emotions in these Chinese Zodiac Animals run deep so and their memories even deeper. This Chinese Snake absorbs and preserves every single moment, and those memories remain crystal clear throughout their entire life. Adding the element of fire to the Chinese Snake makes them dangerous, yet hard to resist. All the positive personality traits are amplified but so are all the negatives ones as well. Chinese Fire Snake people are charismatic and confident. They yearn for fame and fortune and will burn through the world in pursuit of their goals. Those born in The Year of the Fire Snake experience extreme highs and lows. They love and despise with equal force. This Chinese Zodiac Snake is also untrusting, quick to judge and quicker to condemn. The Metal snake is, literally, metal in both its liquid and solid forms. As liquid it can slither in and out of anywhere. As a solid it can be impenetrable. Of the Chinese Snakes, this elemental type is the most secretive and prone to using underhanded methods to get what they want. However, those born in The Year of the Water Snake can be quite benevolent when they so choose. Because of the metal in their chart, this Chinese Zodiac Snake literally craves expensive, shiny things and will work their whole lives to amass opulence and luxury as they can. The Wood Snake is the most charismatic of the Snakes. People and animals can’t help but be drawn to their sparkling personalities (which is good because they live for attention). Stability and long-term success in their personal lives and finances is of utmost importance to this particular Chinese zodiac sign and they are willing to toil endlessly to achieve both. Though the Wood Snake wants to mate for life and is more than capable of doing so, they must be in a relationship where they feel free and safe to express their opinion and thoughts. Those born in The Year of the Wood Snake are among the most psychic of the Chinese Zodiac Animals. They simply seem ‘to know’ about future events. The Earth Snake is easy going (as much as a Chinese Snake can be). They hold themselves to high standards in every way. Because of this, the Earth Snake will have many friends and, if they are in leadership positions, followers; yet this Snake doesn’t crave public attention as do the other elemental types of Snakes. This Chinese Snake is the same talented money maker as their brethren but they are the most frugal of the bunch. Those born in The Year of the Earth Snake are principled and integrous in the extreme. They are slow to form judgement and opinions because they are invested in being fair and just. Highly sexual, the Chinese Zodiac Snake expects nothing short of consummate devotion and loyalty from their partner because that’s what they give in return. Because of their psychic natures, this Chinese zodiac sign somehow always seems to know what will make their partner feel happy, safe and loved. Even if the relationship is fantastic, the Snake can be possessive. If betrayed, the Chinese Snake turns into a deadly adversary who will strike faster than lightning and with the accuracy of a laser beam. For best zodiac compatibility, The Snake’s best options are The Chinese Ox and The Chinese Rooster. If people perceive adult Chinese Snake’s as enigmas, they haven’t met the Snake child. Silent, stoic even (until betrayed), this Chinese zodiac child has the same ability to lay scorched earth as does an adult. Psychic from the start and with a higher than average IQ the Chinese Snake child can find it difficult to make friends and that issue is compounded by their refusal or inability to communicate with the world around them. So happy to know I could be of service to you! Thanks for visiting BuildingBeautifulSouls.com! Thanks for visiting and commenting on BuildingBeautifulSouls.com! 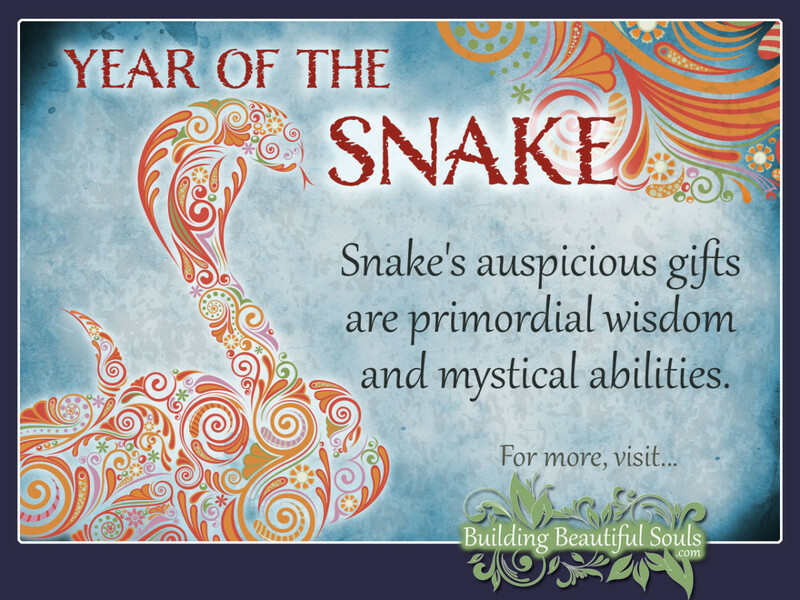 Thank you Bernadette for your amazingly accurate breakdown as to what a person born in the year of the snake can be…I think it’s so important for all of us to learn about ourselves, and the inner workings of our potential and abilities. Cheers! You are most welcome! I totally agree regarding the importance of learning about ourselves. Thank you for commenting on and visiting BuildingBeautifulSouls.com! A metal snake 🐍 lmao that sounds hard to manage. I am an earth snake and Scorpio. Just help her to feel protected and loved. Let her experiment and learn by herself in a safe environment. We snakes have a great intuition , she must learn how to follow it.